Who does Armie Hammer play in The #LoneRanger? Tweet correct answer and #LoneRanger for your chance to win. What color is Helena Bonham Carters hair in the latest look at The#LoneRanger? Tweet correct answer and #LoneRanger for your chance to win. 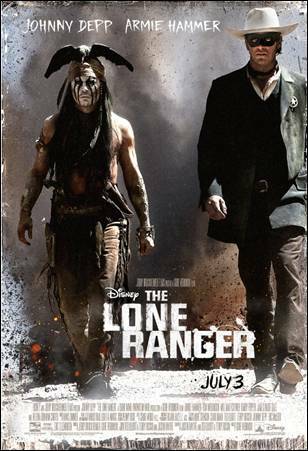 What does the #LoneRanger wear on his face to conceal his identity? Tweet correct answer and #LoneRanger for your chance to win. What word can you see written on the star pin? Tweet correct answer and #LoneRanger for your chance to win. What type of animal does the #LoneRanger ride? Tweet correct answer and #LoneRanger for your chance to win. Finish the line “Justice is what I seek….” Tweet correct answer and#LoneRanger for your chance to win. Finish the Line “If we ride together, we ride for….” Tweet correct answer and #LoneRanger for your chance to win. Tweet your answers @LoneRanger with hashtag #LONERANGER to enter to win prizes. Hurry contest ends today! !